Reach the Masses With An Outskirts Press Book Blast! There’s one more important contribution to your publishing experience that the Book Blast package ensure you will benefit from, however, and it’s not one to miss out on! By investing in the Book Blast, you can emerge from your marketing campaign confident that you pursued every opportunity and option available to you in a methodical way. That confidence isn’t normally something a person can buy, but when you choose Outskirts Press, you choose to employ the full resources of a company known for its reliability, its advocacy, and its commitment to putting authors first. Many authors forget or underestimate the value of a methodical marketing campaign, and as a result never reach their book’s full potential or their personal sales goals. But you don’t have to let this happen to you! You and your book know better–and deserve more–than settling for a lackluster attempt to reach new readers. Now that you have been introduced to several of the key offerings made possible by Outskirts Press’ Book Blast package, we’d like to make it easier and more affordable than ever to add the full complement of tools to your marketing toolbox. Writing your book takes up about 20 percent of the time and energy you’ll dedicate to the publishing process. Where do you spend the other 80 percent? On marketing … if you let it. The 20/80 ratio applies to the average self-publishing author, but it doesn’t have to apply to you. You have the option of putting a solid book marketing plan into place–and we know just the plan for you! The Book Blast package combines all of the tactics we’ve described over the last few weeks–book reviews, press release and PR Publicist, book video trailer, and five hours with a Personal Marketing Assistant–into a single bundle that makes crafting a complete book marketing campaign as simple as 1-2-3! First, you will write, distribute, and promote your press release with the guidance of an expert PR Publicist. Second, you will create and distribute a book video trailer guaranteed to grab the attention of new readers. Third, you will submit your book to reputable book reviewers who will drive traffic and sales. At all points throughout this process, you will have access to the industry expertise and insight of your Personal Marketing Assistant, who will help guide you through the fine points of transforming your marketing campaign from good to absolutely fantastic. 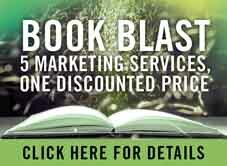 Of course, one of the best features of the Book Blast package is its price! By combining its most popular marketing services, Outskirts Press is able to reduce the total cost by 25 percent to a single payment of only $999. For more information about the Book Blast package, follow the link below.